Several people have pointed out that the Obama administration certainly isn’t the first to oversee IRS profiling. This doesn’t make it right. Further, I recognise that there are other systemic issues (disproportionately well funded interest groups, campaign finance, etc.) that make any real accountability more and more difficult. With all this in mind, I wish only to remind us of our role in all this. While on a personal level we are frequently fine upstanding citizens, we can hardly claim *any* outrage if all we do is listen to jokers and entertainers in order to learn the state of our nation/lives. When two news sources report the same news but with a different spin and each is believed without question, the problem lies with us, not the irritainment news industry that has learned over time how to keep us hooked^. Sometimes fighting for truth is as simple as watching a different channel. ^hint, it’s not by reporting the news without bias. 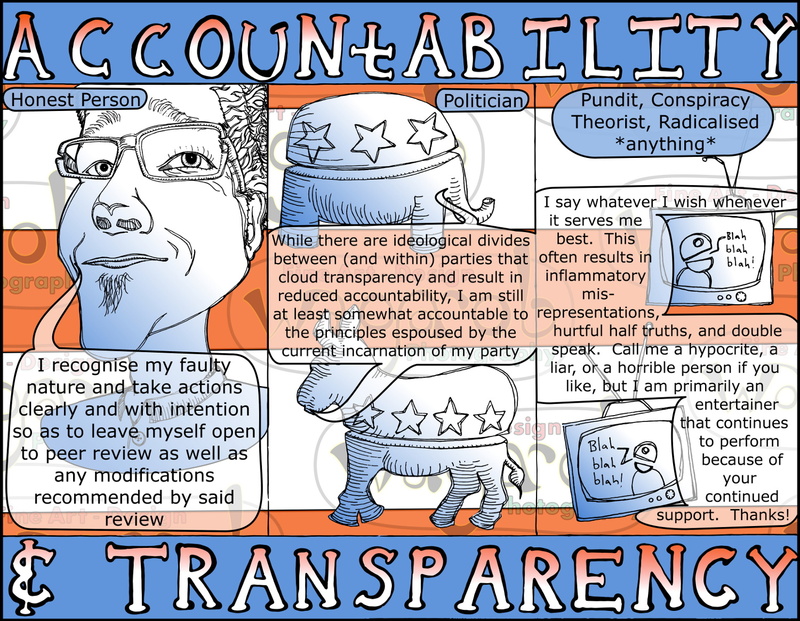 This entry was posted in Social Commentary / Other, Weekly Comics and tagged accountability, campaign finance reform, conspiracy theorist, democrat, interest groups, IRS scandal, politician, pundit, republican, transparency. Bookmark the permalink.